Also known as the white aeroplane, Roc's wingspan is the length of an American football field. Roc's wingspan - Also known as the white aeroplane, Roc's wingspan is the length of an American football field. Features - Powered by six engines on a twin fuselage, the plane stayed aloft for more than two hours before landing safely back at the Mojave Air and Space Port. Flying high - Roc has been designed drop rockets and other space vehicles weighing up to 500,000 pounds at an altitude of 35,000 feet and has been billed by the company as making satellite deployment as "easy as booking an airline flight." 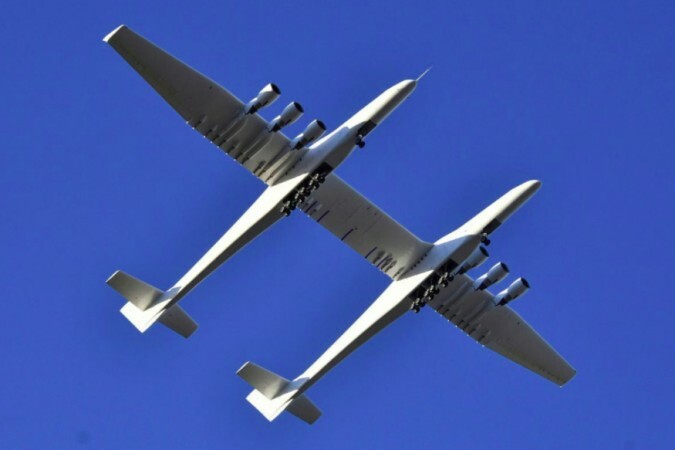 In a statement posted to the firm's website, the Stratolaunch Chief Executive Officer Jean Floyd called it a fantastic first flight. Performance - Saturday's flight, which saw the plane reach a maximum speed of 189 miles per hour and altitudes of 17,000 feet, was meant to test its performance and handling qualities.